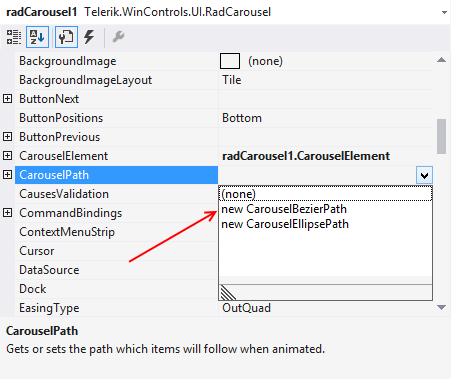 You can set the ellipse path for the carousel using the Visual Studio designer. Drag the RadCarousel control in your form. Note : You can arrange the points only in 2D. The Z coordinate (if needed) should be set programmatically. You can revert the rotating direction (when AutoLoop is set to true) by swapping the V and U points positions. The rotation is always from V to U point. 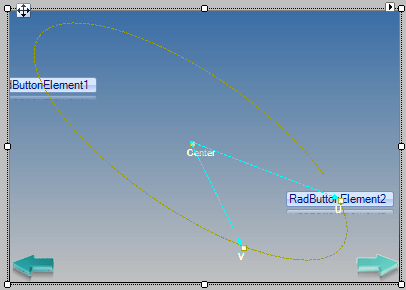 You can drag the ellipse points over the whole designer area, i.e. you are not limited to the form only.